Vintage 50’s inspired dress for women. Feminine, fun and colorful, this dress is suitable for both casual and formal occasions. 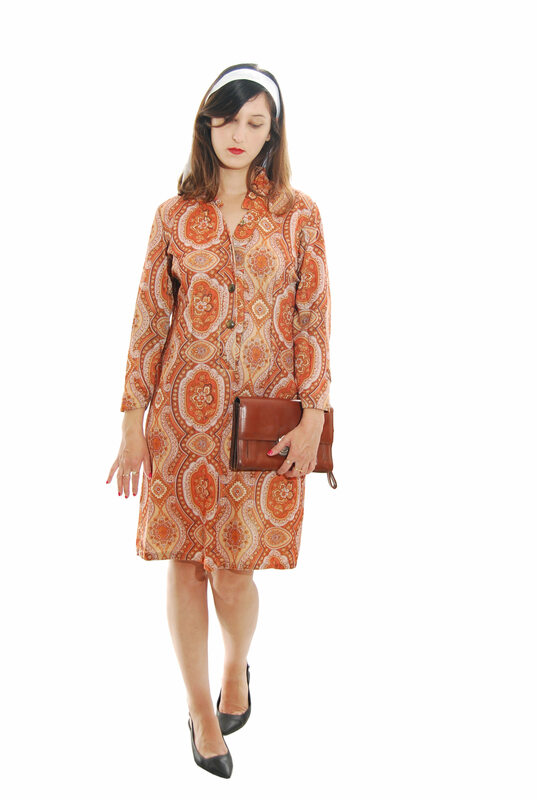 Shirt waist dress, straight skirt, knee length, long sleeves, V-neckline, spread Nehru collar. Red, orange, cream and brown combined into a rich Persian print. Full and rich design along with great quality of fabric, make this dress truly unique. Availability: In Stock Categories: Sale, Vintage Dress, Size L, 1950s. Tags: 1950, 50's, 50's vintage clothing, Mix Color Persian Print Vintage Dress For Women 1950s, vintage, Vintage Dress.